The story of the reintroduction of Black-fronted Piping-Guan (Aburria jacutinga) at REGUA continues. Alecsandra Tassoni, is SAVE Brasil’s Black-Fronted-Piping-Guan project coordinator and will be visiting REGUA to supervise the arrival of the birds. The two females and one male come from a captive-breeding project in Paraná state. Their health tests were undertaken at UENF (Universidade Estadual Norte Fluminense) in Rio de Janeiro state prior to their transfer to São Paulo where they are currently being monitored. Scanning and observation are the techniques used to study their behaviour which include assessing their food demands. There will also be predator training to ensure the birds react naturally to predators once they leave their release pen. The Black-Fronted-Piping-Guan reintroduction project at REGUA is funded by ‘O Boticário’ cosmetic company which is a long- standing Birdlife International partner. REGUA looks forward to the next exciting part of the story. Photograph published with the kind permission of SAVE Brasil and O Boticário Foundation. 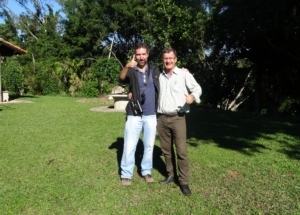 REGUA was delighted to receive Pedro Develey, the CEO of Birdlife International Brazil partner “SAVE” (Sociedade das Aves do Brasil) at REGUA. His visit was partly to discuss the future reintroduction of the Black-fronted Piping-guans (Aburria jacutinga). Pedro’s stay at REGUA was also an opportunity to show off our current tree planting area and the success of the wetland restoration. Pedro had a great time and returned to São Paulo with a decent bird list and was especially pleased to see the variety of avian species in REGUA’s two year old forest. He left us happy and content with the news that the reintroduction project is still ongoing. It’s crucial that a project of this importance develops slowly and steadily and all the pieces are being placed firmly in position. Thanks Pedro!! Ruy’s creativity never ceases to surprise us and yesterday he brought down the feeding stations that he personally built for the Black-fronted Piping-guan release pen. These small constructions will be suspended inside and outside the aviary as part of a “soft-release” method. The birds can eat their ration and after the period of quarantine the aviary door will be opened for them to wander into freedom and around the reserve. If they feel like returning and eating their ration, the stations will be waiting for them, but generally after three days they make a run for it as the instinct for seeking their natural preference for fruits and insects kicks in. Well done Ruy, what would we do without you!! 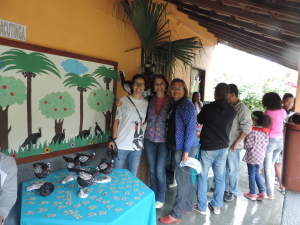 Funchal school recently organised a Science Day in which the Black-Fronted-Piping Guan (Aburria jacutinga) was the star of the day. The reintroduction project of this species at REGUA will soon take place and Livia Dias, the biologist in charge of monitoring them was present with her young son, Artur. With models of the bird and information on the re-introduction process, and the part that these arboreal birds play in the overall biodiversity of the forest, the day was a great success. Both Raquel Locke and Prof. Carlos from REGUA were delighted to attend. 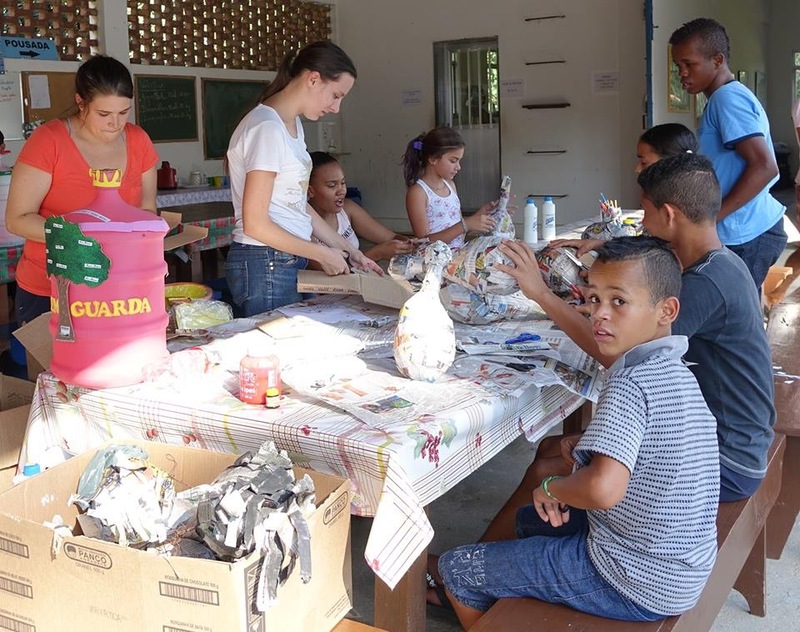 Meeting with local members of the community and especially education in local schools is a vital part of the re-introduction project and also fits well with REGUA’s mission to further environmental education work in the area. Congratulations to the headmaster, teachers, pupils and staff for this wonderful event. One of the most important aspects of any reintroduction programme is the education of the local community. Part of the Black-fronted Piping-guan re-introduction project comprises a series of Teacher Training Courses for local schools. Alecsandra Tassoni from SAVE Brasil (BirdLife International branch) recently held the first of a series of these courses at REGUA. 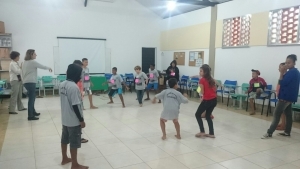 The event was attended by 15 teachers from three neighbouring schools in Guapiaçu, Matumbo and Funchal. The aim of these courses is to introduce this charismatic bird to local school teachers, and explain the background to the re-introduction, with details of its conservation status, its ecological role and the need to protect existing forests to guarantee the perpetuation of this and all species. The teachers were keen to know abut the project and the importance of this bird to the biodiversity of the forest, and were delighted to have the educational material to support them back in the classroom. The day was a great success and everyone learned much about the Black-fronted Piping-guan and its future release at REGUA. The mid-winter month of July can be a very exciting time for birding at REGUA. An influx of winter visitors to the area, in addition to many species moving to lower elevations for the cooler winter months, mean that at this time of year unusual species can be found, and the REGUA wetland is a good place to watch. The avian highlight of the month must be the 3 female Comb Ducks that appeared at the wetland for just 15 minutes on 23rd. Sadly they haven’t been seen since. Another excellent record at the wetland came in the form of a Stygian Owl heard calling for over 10 minutes on 15th, the 2nd record for REGUA, and to the best of our knowledge only the 3rd record for Rio de Janeiro State! 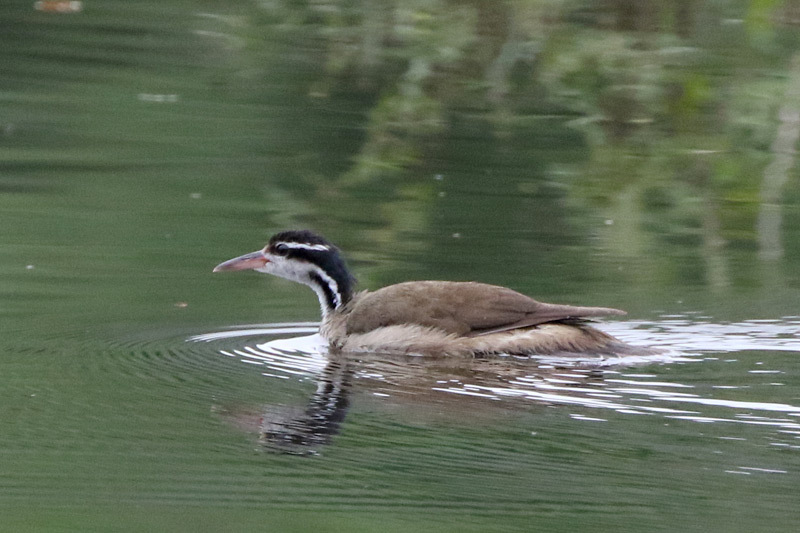 The male Sungrebe continued to show well at the wetland all month, and the much more elusive female also put in an appearance on the 8th (potential future breeders?). Other notable records at the wetland include a Giant Antshrike on the 5th, 12 Azure-shouldered Tanager over on the 5th, a White-necked Thrush on the 6th, 1 Great Black-Hawk on 19th and 2 Masked Duck on 25th. Situated at the edge of the wetland, the lodge garden produced a couple of notables – a male House Sparrow briefly on 3rd and 2 Giant Cowbirds on 15th (both ‘firsts’ for the garden), and a female Chestnut-bellied Euphonia visiting the feeders from the 8th is further testament to the success of the reforestation around the lodge and the wetland. Highlights from elsewhere around the reserve include a pair of Red-ruffed Fruitcrows in a fruiting tree along the Brown Trail on 3rd, a female Sooty Grassquit along the Brown Trail on 5th (the first record for this trail), 4+ Yellow-legged Thrush on the Brown Trail on 5th (a very good count for this trail), a male Shrike-like Cotinga on the Brown Trail on 7th (records are getting closer and closer to the lodge! ), and at Waldenoor 1m Frilled Coquette and a Planalto Woodcreeper were present on 10th. 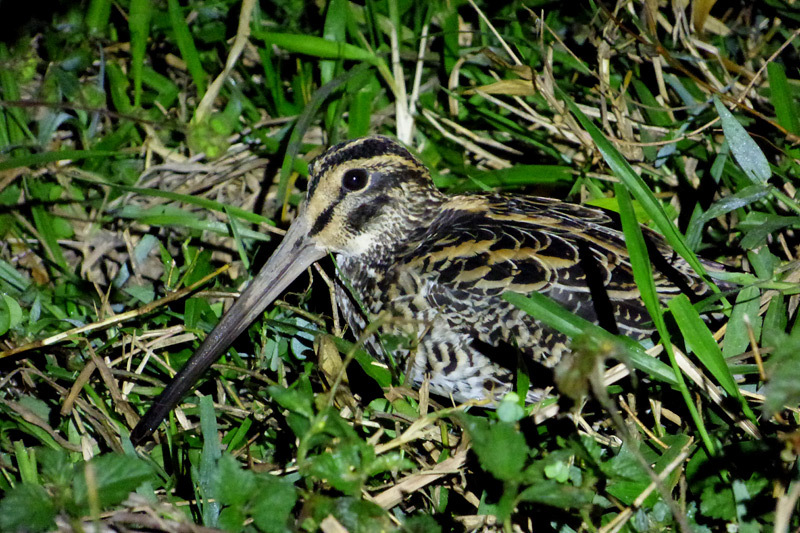 Several excellent spot-lighting excursions led by Adilei in July produced extremely close views of small numbers of Giant Snipe on the the ground by torch-light, along with Scissor-tailed Nightjar, Spot-tailed Nightjar, Common Potoo, Tropical Screech-Owl, and Burrowing Owl. Also just outside the reserve, a Streamer-tailed Tyrant was a notable sighting on 18th. Finally, an intriguing sighting was made this month by one of our rangers, Antonio, who spotted a Black-fronted Piping-Guan feeding from a fruit tree. Presumably one of the 10 birds introduced at REGUA in 2008, this is the first sighting since 2010 and this bodes well for the forthcoming introduction of a further 40 birds as part of the SAVE Brasil Projeto Jacutinga reintroduction programme. The old pen used for the Red-billed Curassow re-introduction programme which took place between 2005 and 2008 has been refurbished. It is ready to receive the Black-fronted Piping-guans (Aburria jacutinga) over the next four years, as part of the programme financed by O Boticario and Birdlife International partner SAVE. 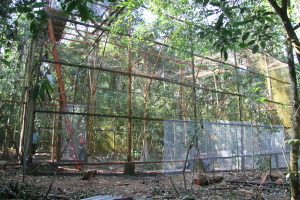 The release pen is eight meters by 30 meters and eight meters high, with a secure cover of mesh to prevent snakes and rodents getting into the aviary. There were 20 Black-fronted Piping-guans released in 2009 as part of the previous Red-billed Currasow project with Crax/ Brasil. There were sightings in the forests of REGUA 2 years ago, but just recently one local resident saw a pair of these colourful birds in the forests of the Matumbo Gap. As they are an arboreal species, the release pen has to be very high and the biologists accompanying the project have a strategy to ensure that the birds are encouraged to stay off the ground, thereby improving their chances of survival after release. They need to remain in the campus of the trees away from hunting mammals, rodents and the occasional stray dog. The more they stay in the canopies, the greater their chance for survival. This is an exciting project that sees birds coming from a recognized bird breeder Tropicus, passing through the University of North Fluminense’s quarantine pens for a period of a month, adapting to the release pen and then freedom! REGUA is delighted to offer its forests as a gateway for their release to the wild. They are a species that will help disperse fruits, especially the threatened heart of palm, Euterpe edulis and contribute as a charismatic species to represent REGUAs commitment to nature here. On September 14th and 15th the Black-fronted Piping-guan Project Team was at REGUA, one of the sites where the species will be reintroduced, to conduct several activities. On the 14th, the Project was presented during a meeting of the Rural Development Municipal Council. 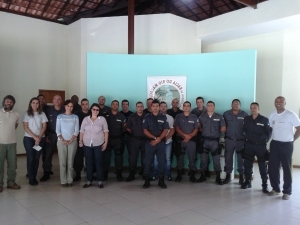 Twenty-six participants attended, among them council members and guests. Later that day, the 11th activity of the Guide for Practices and Experiences with Nature (available in Portuguese for download: http://goo.gl/XqcF56) was held with 13 of REGUA’s Young Rangers. 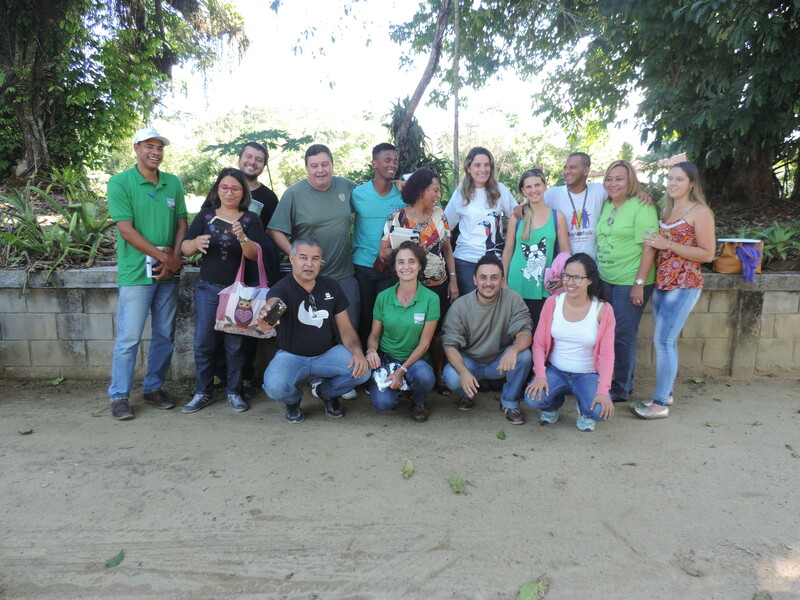 The following day, the Project was presented in Bacia do Rio, Macacu Permanent Preservation Area with the presence of the Area Manager, REGUA’s vice-president Raquel Locke, and the 5th UPAm (Environmental Police Unit). In total, 18 participants attended, all of whom are important partners in the species’ protection network. Without the support of the local people and the REGUA team this project would not be possible. 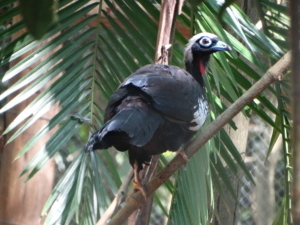 The reintroduction of Black-fronted Piping-guan at REGUA is now expected for the first semester of 2016. In October 2015, the first 20 Black-fronted Piping Guan (Aburria jacutinga) will be released at REGUA, the fruit of a partnership between REGUA and Birdlife International’s Brazilian partner SAVE Brazil , a project supported by Brazil’s cosmetic giant “O Boticário”. This stunning Guan was discovered by German ornithologist Johann von Spix in 1819 in his travels in Rio state, not 50 km from REGUA. Even in 1837 Charles Gardner described their abundance in the same place describing the hunting of the species by locals. Noted Brazilian ornithologist Helmut Sick still noted local presence in 1915 in the Serra dos Órgãos but by 1950, but sadly not even two hundred years after their discovery, they were extinct in Rio State. Although REGUA released 20 birds in a trial in 2009, the project will be the first major concerted effort to get the birds back in nature in its home ground. 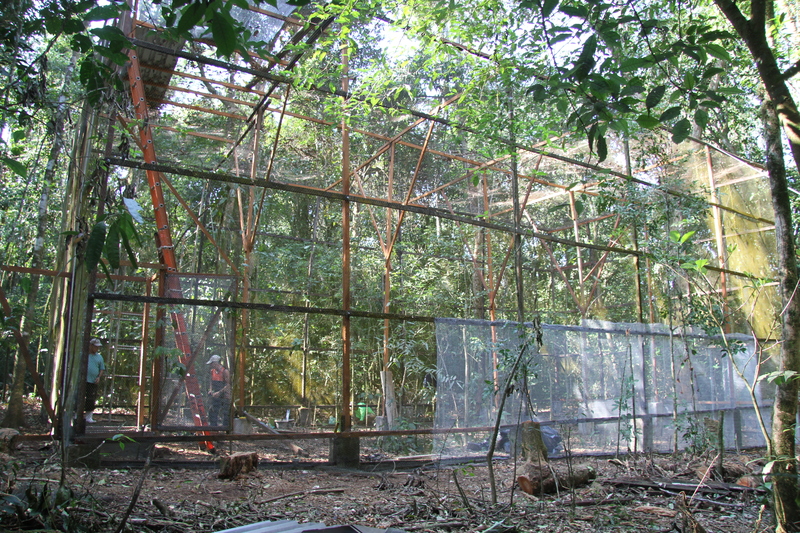 The birds for release will be sourced from renowned captive breeders, Institute Tropicus. Adolescent birds will be transported to North Fluminense University ( UENF) for full veterinary health checks and final preparation for release under the care of Dr. Carlos Ruiz Miranda, before arriving at REGUA this coming October. Everyone is very excited and the release pen at REGUA is currently being refurbished in their preparation. Following on from the great news that a reintroduction programme for the Black-fronted Piping-guans (Aburria jacutinga) is to take place, the young rangers have been keen to find out more. 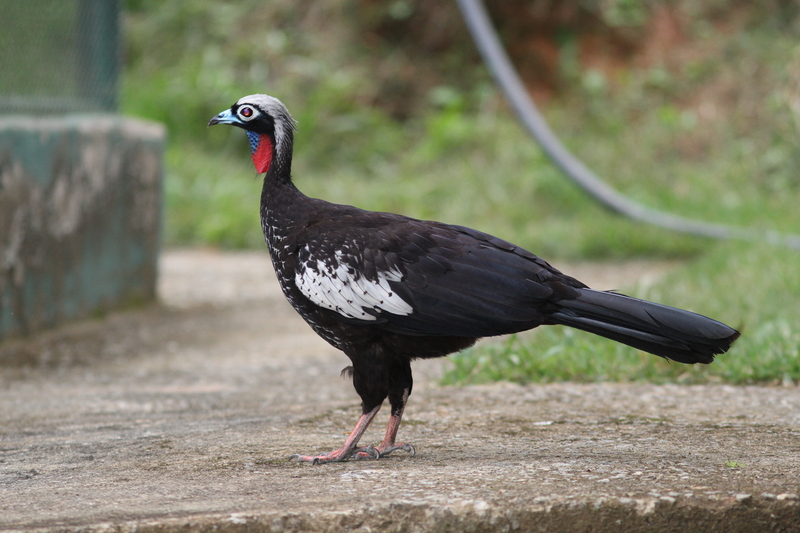 The Black-fronted Piping-guans belong to the cracidae family (the same family as the Red-billed Curassow, the subject of an earlier re-introduction at REGUA) and they are very similar looking birds. The Black-fronted Piping-guans can be recognised by their white quiff, white spots on their wings and blue and red wattle. Like all re-introduction programmes the re-introduction of the Black-fronted Piping-guans must be accompanied by an awareness programme, and who better to take the first step than REGUA’s Young Rangers. Various activities will be taking place; learning about the species, walks in the forest, art and craft activities. 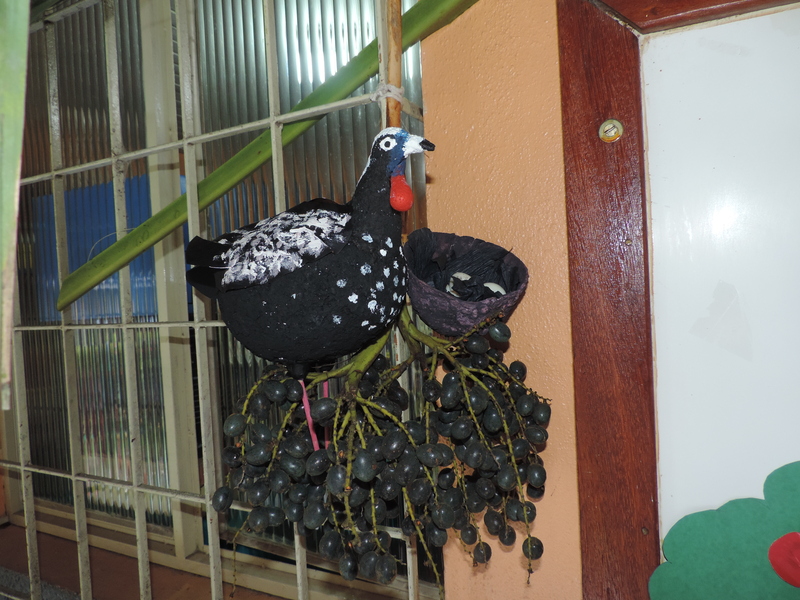 One of the first exercises in getting to know about the Black-fronted Piping-guan was to make papier-mâché models of the birds, using recycled newspaper and card. The Young Rangers were supported in this by REGUA Volunteers Katerina Samara and Emma Louise Smith. The eagerness and interest the youngsters have shown in the bird is a breeze of excitement about their arrival at the reserve. Soon there will be a team of papier-mâché Black-fronted Piping-guans waiting to welcome their real-life counterparts back to nature.